Tasting 158 samples of 2013 Beaujolais crus, the British wine magazine Decanter underlined the quality, consistency, elegance and delicacy of the wines. They didn’t miss any positive adjectives to describe Beaujolais wines. Often claimed to be the food-friendliness as well as drink on its own perfect style, they are also low alcohol and generous which makes them your best companion for the summer. If Beaujolais crus are usually drunk in the 5 first years of production, don’t you worry if you forget a bottle in the back of a cupboard. Gamay grape with such minerality has also a good ageability capacity and you might be well surprised. What’s not to be liked indeed… at such a price? 40 Fleurie were tasted and my father’s wines, from Chateau des Moriers, appeared in the highly recommended with the second best grade in the appellation. My cool importer and reseller in the UK, Smiling Grape, had insisted to send some samples, always a logistical challenge that I usually do my best to postpone. What a refreshing reward when we’ve received the results! Vicky’s Fleurie 2013 is Highly Recommended in the August Issue, “Immediately attractive, heightened nose, with quite a rich, savoury palate that shows plenty of mineral-toned cherry fruit. An elegant style that makes attractive and rewarding drinking now.” 17/20 – 90. Well, that’s good news, I’m drinking it all summer long. Buy it online in the UK or reach me at missvickywine @ gmail . com for more info. Matt from Smiling Grape has been working with me for over 3 years now. Always ready to share my wines in his shop or on social media, he is a true supporter of Vicky’s Wines. 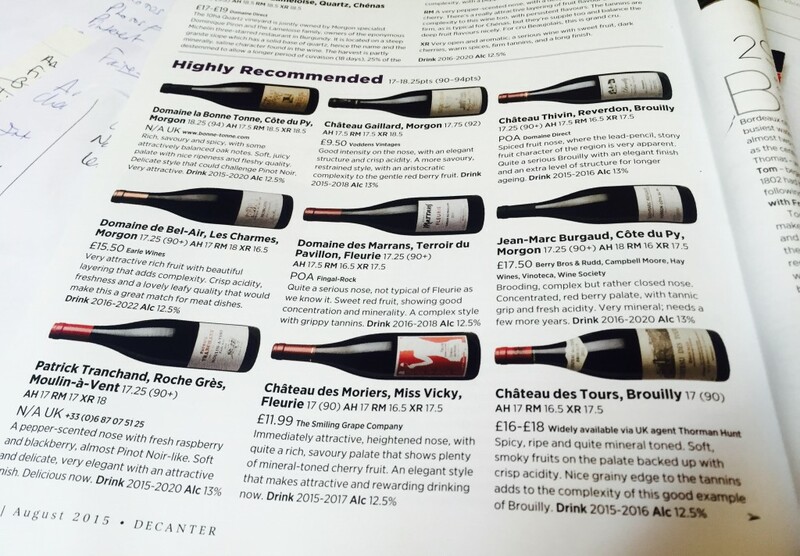 Thank you for sending the wines over to Decanter Matt and long life to my Fleurie in the UK! Next: Harvest 2015 soon in Beaujolais!